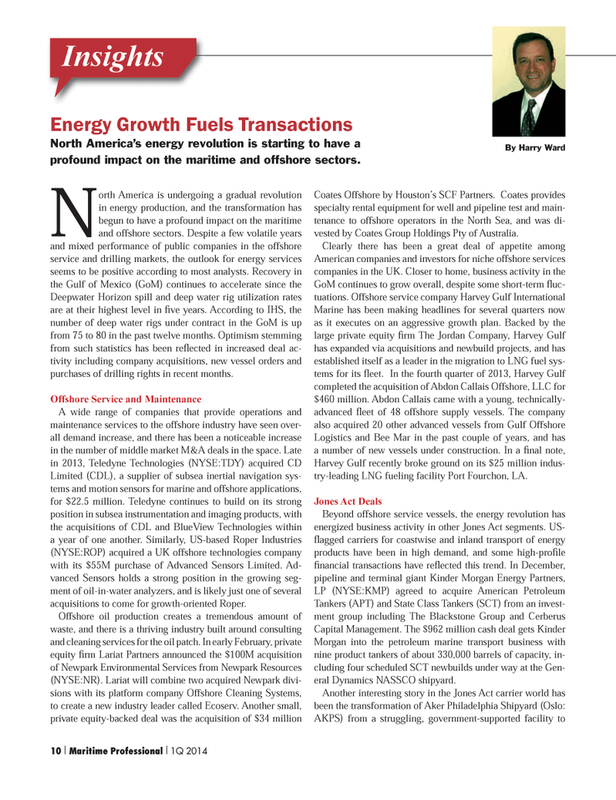 North America’s energy revolution is starting to have a profound impact on the maritime and offshore sectors. Deepwater Horizon spill and deep water rig utilization rates are at their highest level in fi ve years. According to IHS, the number of deep water rigs under contract in the GoM is up from 75 to 80 in the past twelve months. Optimism stemming from such statistics has been refl ected in increased deal ac- tivity including company acquisitions, new vessel orders and purchases of drilling rights in recent months. Limited (CDL), a supplier of subsea inertial navigation sys- tems and motion sensors for marine and offshore applications, for $22.5 million. Teledyne continues to build on its strong position in subsea instrumentation and imaging products, with the acquisitions of CDL and BlueView Technologies within a year of one another. Similarly, US-based Roper Industries (NYSE:ROP) acquired a UK offshore technologies company with its $55M purchase of Advanced Sensors Limited. Ad- vanced Sensors holds a strong position in the growing seg- ment of oil-in-water analyzers, and is likely just one of several acquisitions to come for growth-oriented Roper. Coates Offshore by Houston’s SCF Partners. Coates provides specialty rental equipment for well and pipeline test and main- tenance to offshore operators in the North Sea, and was di- vested by Coates Group Holdings Pty of Australia. Harvey Gulf recently broke ground on its $25 million indus- try-leading LNG fueling facility Port Fourchon, LA. Morgan into the petroleum marine transport business with nine product tankers of about 330,000 barrels of capacity, in- cluding four scheduled SCT newbuilds under way at the Gen- eral Dynamics NASSCO shipyard.